From Corvallis, Oregon, home of Oregon State University, we bring new ideas and insightful lectures from leading researchers and scientists to a pub full of inquisitive minds every month. Recorded live at the Old World Deli and other Corvallis locations, these episodes cover topics ranging from the science of marijuana to black holes and beyond. 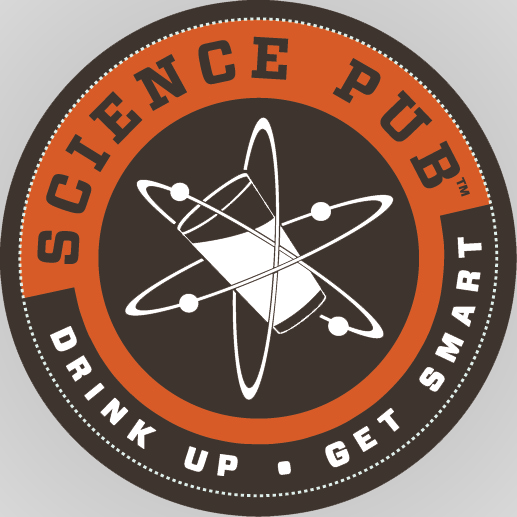 Science Pub is brought to you by Terra Magazine, the Oregon Museum of Science and Industry (OMSI) and the Downtown Corvallis Association. You can subscribe to the podcast by copying the rss feed into any podcasting software or app, or use the links below to subscribe on iTunes and Google Play. Every time you rely on your phone to translate a foreign language, you ask your smart speaker to do something or your car skids on black ice, you’ve taken advantage of artificial intelligence. While Hollywood may pose a fearful future in which humans battle wily robots, the reality is that this technology faces significant limitations. Initiatives to create self-driving cars and swarms of flying drones occasionally capture headlines, but daunting hurdles remain. Distinguished Professor William J. Ripple discusses how his conservation research and concern about the global environment and climate change led to him publish the Scientists' Warning to Humanity paper, which has been signed and endorsed by more than 20,000 scientists from 184 countries. He shares his journey from ecological research to science advocacy, providing suggestions for how the planet might avert an impending environmental crisis. Whether it's genetically modified crops that grow without any interference from pests, or mobile apps that a landowner can use to calculate the amount of grass available in their field, technology allows farmers to save time and money. Free Range or Cage Free? Whether scrambled, fried or baked in a cake, eggs are a mainstay in homes and restaurants, but in recent years, the industry has seen major changes in production practices. James Hermes, Associate Professor in the College of Agricultural Sciences, discusses the history of the chicken industry in Oregon and the impacts of the shift to “free range” and other methods of producing eggs. Sean Fleming, book author and courtesy professor in the College of Earth, Ocean, and Atmospheric Sciences at Oregon State University, discusses how rivers interact with the land in the Northwest and around the world. Larry Landis, director of the Special Collections and Archives Research Center at Oregon State, discusses the origins of OSU research and its connections to contemporary issues. The marbled murrelet is a bird of two worlds: it gets its food from the ocean but raises its young up to 50 miles inland in mature forests. Jim Rivers, assistant professor in the College of Forestry, discusses an ongoing Oregon State University research project to learn more about the behavior of this endangered species. Hops chemistry expert Tom Shellhammer shares a glimpse into the future of craft beers as new varieties of hops and barley work their way into brewers' recipes. Heather Knight, a researcher in the College of Engineering engages in a lively exploration of the world of human-robot interaction. Local author Steve Carpenter explores the fungi found near the Coast Range's tallest peak. Marli Miller, author of the book Roadside Geology of Oregon and professor at the University of Oregon walks us through the layers of geological history you'll find driving across the Pacific Northwest. OSU Professor Monique Udell talks about her research into dog behavior with insights into their connections to humans and their links to and differences from their wild cousins. This August we will experience the first solar eclipse entirely within the boundaries of the continental U.S. since 1776. Join Randall Milstein from the College of Earth, Ocean, and Atmospheric Sciences to learn about eclipses past and future. Cakes, breads, biscuits and other baked goods rise to the occasion as they heat up in the oven, and the agents responsible for this feat have a surprising story. At the April 10, 2017 Corvallis Science Pub Sue Queisser discussed the history of leavening agents and offered troubleshooting tips that help bakers achieve better results. Did the first people come to North America by land or by sea? Did they travel inland or along the coast? How does the human story begin here? Loren Davis, anthropologist at Oregon State University, shared the latest evidence for early human occupation along the Pacific slope of the New World and archaeological links between early sites situated around the Pacific Rim. In the movies, the typical robot is as soft as a tin can. Inspired by animals that slither, swim and crawl, engineers are designing new robotic systems as soft as skin and muscle. Yiğit Mengüc, assistant professor in the Oregon State University College of Engineering, shows how he uses 3-D printing, biodegradable rubber and other materials to produce robots with the agility of geckos and the flexibility of snakes. With Christopher McKnight Nichols, Assistant Professor, Member of the Council on Foreign Relations at Oregon State University: from rhetoric about putting "America First" to arguments about the founding of NATO, global concerns are playing a prominent role in this year’s presidential elections. Botany professor Linda Hardison will discuss the Oregon Flora project, of which Hardison and her colleagues published their first volume, Flora of Oregon, in 2015. The Oregon Flora Project provides information about the plants of the state in ways that are relevant to all citizens. Jane Ishmael is an associate professor in the Oregon State University College of Pharmacy and at the June 6 Corvallis Science Pub, she discussed what scientists know about the effects of marijuana on the body and how it interacts with cells and systems.